The United States Tennis Association has a rating system for determining the level a tennis player has achieved. In episode 28 of my Gotta Play Tennis podcast, “Rating your Skills by USTA Standards” (available on iTunes), I relayed their approach to evaluating the level of a tennis player. Competition results however don't really measure, in my estimation, the true person who takes the court. Some things are obvious, and some not so much. 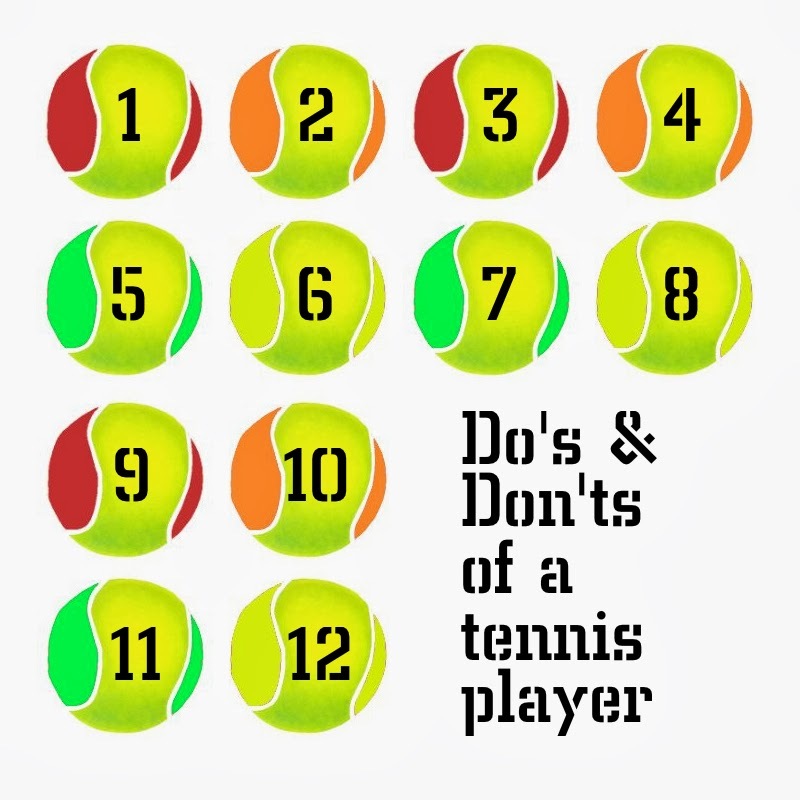 Therefore, here is my personal representation of a tennis player based upon the principles of do’s and don’ts. Why 12 points? We in the U.S. seem to like this number as we commonly measure things by the dozen. Besides, this was written between December 25th and January 5th for which, on the Christian Calendar, is known as the 12 Days of Christmas. 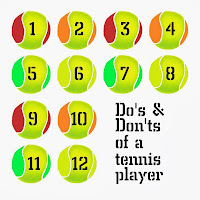 Do be ready, willing, and able to deal with uncomfortable weather conditions, either hot or cold, windy or calm, and sunny or overcast on public or private outdoor tennis courts. Dogs barking, kids yelling, and helicopters flying are all a reality. Do have a realization that tennis is hard work requiring almost constant movement and even more visual awareness. If resting is your thing, tennis is not for you. Do understand that tennis is a leg sport, and as such, requires one to develop strong leg muscles that can assist in durability on the court in long rallies and longevity for the unknown length of a tennis match. Regular stretching is a must to protect from injury. Do take comfort in the ideal that tennis is only a game, and unless it is your livelihood, should be viewed as a fun and entertaining sport that provides exercise, camaraderie, and personal achievement. Do be accepting of all ability levels, both as partners and opponents, as they too are in their own time line of skill and athleticism. Don't be stubborn about shot selection. Use the most reliable shot in your arsenal. When you are in danger of losing the rally or point, do not forget that the forehand is the most biomechanically efficient shot for humans to hit. Do be studious by learning all you can about the sport you love—historically, tactically, and strategically—so that all will feed your overall ability as a player. Be patient with your own growth. Invest in some lessons from a qualified instructor. Don't purposely hit shots closer to the lines than 1-2 feet and not with any more pace than necessary. Consistency and not sensationalism wins the day. Going for more or less than required in a given situation is a losing recipe. Don't beat yourself by letting your aggravation from bad on-court decisions or poor shot execution predict your outcome. Embrace the ups and downs. Live in the present—the ball you are hitting—and not in the past. Do be a good sport when either winning or losing a match or a rally. Applaud quality shots by your opponent. Be fair with all line calls. Give credit where credit is due and congratulate the victor or refrain from gloating over your own win. Don't lose your focus from shot-to-shot during a rally and always be totally aware of the things that affect your positioning such as spin, depth, direction, and height of the oncoming ball. Don't let others who worship at the national altar of football, baseball, basketball, and ice hockey ruin your love and respect of the international sport of tennis. One man’s trash is another man’s treasure. Feel good about the fact that you actually “play” your sport and can do so hopefully for a lifetime. When I began this piece, I wondered how I would find at least 12 things to add to the list. As I reached the bottom, I realized the number 15 had already been written and I felt like I was just hitting my stride. In other words, it is obviously difficult to sum up the measure of a tennis player in just 12 bullet points. With that said, if you truly absorb and take to heart the above principles, you surely are on your way to being a proud and accomplished tennis player. HAPPY NEW YEAR to you and yours. May this be the year that tennis becomes all you want it to be in your life.